This is a great account for organizations that only deposit or write a few checks each month. There is no monthly maintenance fee when combined with other business account balances. eStatements are a requirement for this account and are typically available the first day of each month. This account earns interest and has a low monthly maintenance fee. There is more flexibility on the number of checks written and processed each month. There is an option of paper or eStatements with this account. Have more than $50,000 to invest? This is the account for you to tie to your Business Checking. The more invested into the Money Market, the higher the interest rate. You are allowed to make six withdrawals from your Money Market account per month. This is the basis of your Solidarity membership. Your original $5 deposit remains in this account. The dividends in this account are paid and compounded monthly with payroll deductions for deposits. The primary function of any financial institution is to be a safe place for money. 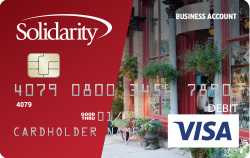 At Solidarity, your money is not only protected by a large, metal vault, but it's also federally insured by the NCUA.